The big tests are next week for my kids. Math is Monday and Reading is Tuesday. I cannot guarantee that every one of my students will pass these tests. In preparation for the tests, I cannot say that I have scientifically broken down the identified objectives and systematically formed small group learning activities to strengthen those objectives. I have done this a little bit, but it has definitely not been the most important thing in our classroom. I cannot say that I have focused the last three weeks on last-minute test preparation. These tests are not the end-in-mind in my classroom. I can tell you that my students talk about the things they read almost every day this year. They analyzed good pieces of writing for author's purpose. They made connections to their readings. They wrote critically about the things they read. They wrote their own pieces using author's tools and tricks they encountered and discussed. In math, they collaborated to find solutions. They solved problems multiple ways. They proved their solutions were accurate. Oh, and they did a TON of mental math. How will they perform on the test? They will be fine. Some will do wonderfully. All will try their best. The kids who didn't pass the test last year may pass it this year. Yes, I want them to do well! I know each child wants to pass and do well. Their families want them to do well. The campus folks want them to pass (or better.) The district wants them to pass or better. The community wants the campus and district numbers to look good. No one is cheering for mediocrity or worse. 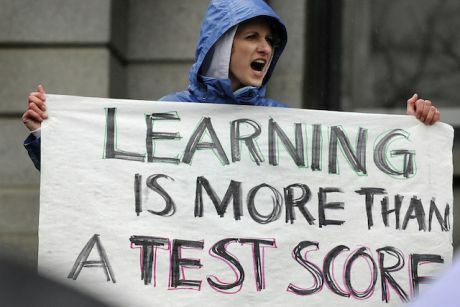 However, ask anyone what they want from public school education and they never start with, "Great test scores." They always talk about graduates that can solve problems, communicate well, and perform well on a team. When the test comes around, take it seriously. 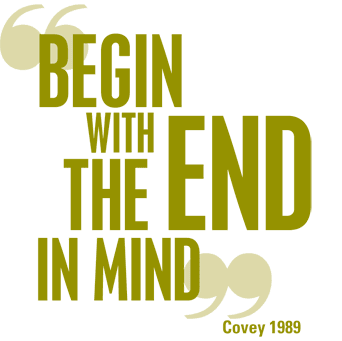 At all other times, keep your desired end in mind at the front of your lesson design! Are they students or authors? Do your students know why they write? Do they write because they are trying to communicate something, or do they write because you told them to do so? The more I work to refine my writer's workshop for my 4th graders, the more I realize that it is challenging to keep writing authentic for all of my kids. No matter the subject matter or the purpose for writing, it is contrived for some kids. I don't believe that our little ones come to school without anything to write about. I think that if every Kinder kid had a switch on their backs that could be flipped to, "I AM A WRITER," every one of them would begin to write voraciously. Everyone one of them would love the opportunity to communicate. I can imagine several of them thinking, "WAIT! You mean there are TWO ways for me to tell my very important stories?!?!?! I can use my voice AND my pencil?!?!?! AWESOME!" Then they get a little older and they get through a few years of writing lessons. Some of these lessons may be great! They may be excellent activities that allow kids to write for meaning to an important audience. Many lessons are not so great. Too often, we ask kids to write for the sake of a state-mandated or district-mandated reason. We do this because they need to learn a certain writing objective. We try to make that learning objective fit within their purpose for writing. It doesn't work for all of them every time. For some of them, it doesn't work very often. Many of them become reluctant to write. They are told what to write about and the purpose is minimalized or meaningless. We give them feedback about their writing that makes it sound like it isn't good. More reluctance. Then they hit 4th grade. The writing grade. The writing test. Panicky teachers get even further away from authentic, purpose-driven writing. But more tragic, the test absolutely requires a ridiculous format. The parameters are set up so that teachers must teach kids how to fit their writing into the little box the state asks for. It is challenging to keep their writing authentic and engaging when the test will give each child and the school a score. Even as I tried to ignore the test, there came a point where I had to focus on the format they would be expected to "write" for. If there was no test, would my writing instruction be better? Absolutely. And the units of study I am expected to follow? The written curriculum? It is definitely a challenge to get it all in. Really, it is impossible. Sure, I could spend seven minutes on period usage, 13 minutes on Similes, and 2.5 minutes on the semi-colon. That would just about cover it. Sean Cain, the author of The Fundamental Five, has data that shows it is better for student achievement when a teacher "gets it all in." I believe his information specifically pertains to content subjects like science and social studies. Regardless, too many teachers see all written curriculum objectives as checklists. Cover it all! Other researchers, like Mike Schmoker, have evidence that the most successful teachers totally simplify the written curriculum and focus all of their energy on providing students with multiple opportunities to write, read, discuss, and argue They basically ignore the checklist of objectives. They ignore the "written and guaranteed" curriculum. If the language arts curriculum for the state of Texas was better, would my writing instruction be better? Absolutely. Regardless of the parameters, I make the plans for writing in my classroom. I keep going back to the word authentic. If I dictate what they write, is it really authentic? Can I design a classroom where they want to write because they feel compelled to communicate through the written word? Can I create classroom experiences that include experiences for students to prepare written arguments for important opinions? Can my classroom compel kids to communicate their scientific findings? Can my classroom be a place where kids write for the art of writing? I swear they knew this stuff before Thanksgiving! So you want the learners to learn what you want them to learn. You have chosen your learning targets and you have designed learning activities to engage them. You have taken the time to investigate what your learners already know so that you can build on their prior knowledge and experience. Then you get started and it becomes clearly evident that the learners don't know what you thought they knew. You ask questions for clarification and you realize they really don't get it. Sometimes educators make assumptions about the prior knowledge of their learners. Sometimes we assume that just because a kid has finished 8th grade math, he is ready for algebra. We frequently assume that our own class knows what they need to know from our own prior lesson. We may even see data that tells us they know it! More realistically, the data tells us that the kid knew the right thing on test day in the manner that it was tested. So they don't know it now. As a teacher, what do you do? Undoubtedly, it is frustrating to work so hard "teaching" something, only to see that they don't know it at all later on down the line. How do you handle the frustration? Do you find fault in the students' work and their study habits, or do you look at your own work and determine what you can do better next time? Do you bring out what you have already tried or do you go find new and better? For over 20 years, I have heard that children are less responsible now than they once were. Shoot! I am pretty sure I heard that I was less responsible than the kids who came before me! Is the level of responsibility and self-reliance of kids declining? Do kids perform fewer chores than they once did? Are students less able to organize and maintain their "stuff" at school? Can they find their own stuff? Can they organize their own thinking? Do they seem more helpless than a few years ago? At school, teachers constantly create new and improved methods to keep the kids organized. We want them to find their "stuff." We want them to hold on to it until they need it again. We want them to be responsible for it. Binders and color-coded folders and labels and dividers and shelves and cubbies and trays and boxes and checklists and rubrics and agendas and planners and...on and on and on... Some classes have ALL of those things. Some kids can handle our systems of organization perfectly. They do so every year, regardless of how the teachers differ in their approach. Other kids are seemingly hopeless each year, regardless of how the teachers differ in their approach. And variations in between. Some kids keep a messy desk, have a messy backpack, they leave their lunch in the car at least once a week, and they never seem to get homework done. Nothing gets signed and returned on time either. 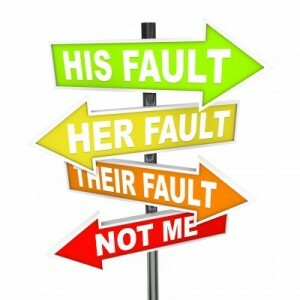 Some kids have a tough time taking responsibility for their own choices. They will try to blame others rather than looking at their own actions, "Little Glenn made me do it!" Unorganized, or irresponsible, or always pointing a finger...who do you blame? Some teachers look at the kids and blame the parents. They say things like, "If parents did a better job at home, kids wouldn't be like that." This statement may actually be true some of the time. It doesn't matter. Blaming anyone for a child's behavior is a waste of time. Instead, look forward and focus your energies on teaching this child how to act in your classroom and in your school. Teach the kid the behavior you seek. It is OK to teach kids that there are a different set of rules and a different mindset for success at school. Create a classroom that works for this student to be successful at school. Or...deal with the status quo. The things that absolutely must happen. No matter how positive or negative, no matter whether or not they are value-added or worthless, and regardless of how well they are done... they must be done. Some person or group made a decision to deem some thing... non-negotiable. The decision-maker believes in that thing and wants to see it come to life and add value to the efforts of the district or campus. A district I worked for a few years ago has a list of non-negotiables for elementary reading instruction. It lists a handful of things that needed to happen every day, in every classroom. One of them states, "Every child writes every day." To some teachers, it means that every kid develops original thoughts and puts them on paper. To a few teachers, it means copying a poem. Both are called writing. One is not writing. All of these teachers checked it off their "must do" lists. Another school insists that every child practices and masters basic math facts through daily, five-minute practice. It happens every day for every kid. The results are quickly graded and recorded by non-classroom teachers. It takes less than ten minutes a day and there is accountability for task completion. Check it off the list. Some teachers really use this practice to fills the learning gaps for kids who don't understand how the numbers work together. Other teachers simply pass the sheets out, then collect them five minutes later. Another school requires students to maintain Level Zero volume in the hallways. There are signs everywhere that state the required volume level. Teachers give numerous, daily reminders. Many students walk through the halls holding up a ZERO sign. The expectation is Level Zero. This non-negotiable is clearly defined and well-understood by the teachers. One would think that the students also fully understand the expectation. The hallways are not silent. The biggest volume in the hallways comes from teachers voices trying to get kids to hush. Another district expects every student in certain grades to complete a science fair project. The informational packet is sent home. Teachers are given the discretion to choose how much control they take over the projects. Some teachers simply send it home, then wait for the due date. Other teachers manage the steps of the project throughout the process. Some kids present projects that they created on their own. Others present their mom's project. And everything in between. I can think of other school-related non-negotiables. There are so many. Some of them are etched in stone while others are simply understood. Whether they are called non-negotiables, mandates, or "we wills"... they imply required compliance. Non-negotiables define the necessary compliance. They do not state the required knowledge or buy-in. Those are intended to come later. If everyone complies with the mandate, the practice will build knowledge and the results will garner buy-in...hopefully. Because of that, they are often seen negatively by lots of folks. Some folks even apologize for using the word, "non-negotiable." Like it is a bad word. A non-negotiable isn't a bad thing as long as it is communicated well, it adds value, and it is purpose-driven. What is missing from the scenarios above to make them more successful? What non-negotiables do you have in your classroom or your school that need improvement? More importantly, are you encouraged to discuss your non-negotiables? Some kids love this joke! Other kids don't get it. As I participate in more conversations each day with kids and teachers, I have noticed a continuum of interrupters. Some people cannot let you finish a single sentence without interrupting. Some people never interrupt. They practice Covey's Habit #5 almost perfectly, seeking first to understand before trying to be understood. Don't we all love to be listened to and heard! On the interrupting side of folks, there are many different reasons and styles. Some simply cannot wait to share their own thoughts. Some are excited about the topic and want to participate. Some understand your point-of-view perfectly and don't need to hear any more. They interrupt to move the conversation forward. Some want to tell your story for you or better than you. Then there is the method of interruption. There are the, "Umm hmm-ers." They voice their agreement throughout your words with a barrage of agreeing hums! There are the sentence finishers. How lucky not to need to ever finish your own sentence! There are the folks who already know what you are saying. They provide a response before you have even posed a question. There are the story-tellers. They interrupt in order to tell you a personal story related to the topic of conversation. There are the questioners. They have a question before you finish what you are saying. In a classroom, you know these kids because their hands pop-up after the first 6 words, regardless of what you have already said or what you still need to say. My favorite, new interrupting style is the, "Yeah, no" and the "No. yeah." These folks may or may not agree or disagree. They usually add their two cents with truly contradicting what has already been said. With students, it is easy for most of us to handle the interruptions. As a teacher, you choose the correct response. How do you handle it with adults? Is it different? What about that one person on campus that interrupts everyone, every... single... time? Everyone has that one coworker that interrupts every single time. So much that it is impossible to have a conversation. Do you give up? 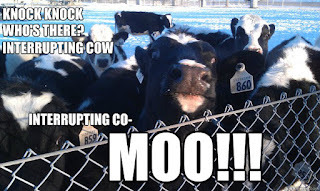 Do you interrupt back? Does your facial expression make it clear that you don't appreciate the interruption? Do you handle it gracefully, while always seeking to first understand? Or do you put your head down and simply avoid the conversation altogether? It seems to be a common response for folks to follow the interrupting lead. In order to participate with the interrupter, lots of folks are compelled to interrupt back. Other folks just stop trying to talk. If you get two interrupters in a group, they just end up talking over each other until the oxygen is depleted from the room. The silver lining in this situation is the valuable side conversations that ensue while the two of them make noise together. To make this better for your work team, what do you do? How do you make sure there is equal voice for each team member? This is not a rant against state testing. I was clearing out some pages of notes from the umpteen legal pads, spirals, and composition notebooks I have taken notes in throughout the last several years and I came across a couple of intriguing reflective questions. What would you do differently if your state test disappeared? What would you keep doing if your state test disappeared? I hope that most educators would continue doing many of the engaging and relevant lessons that kids love. Of course we all would! These are the lessons that are the most fun for us too. I can also guess that there are several instructional practices that would disappear from your spring-time classrooms. What about things like assessment and curricular mastery checks? What would change? What would remain? What would change in the area of differentiation? Would you still scaffold lessons for students lacking pre-requisite skills. What about RTI? Would you continue to provide extra, targeted instruction for struggling learners? It is easy to say yes to these questions, but it is also easy to see how easy it would be to let some of them wane. Even with the best of intentions and even when we see clear benefits to certain practices, they typically diminish when the pressure of results diminishes. It is also easy to argue that a much softer accountability standard would improve the higher level thinking and problem-based learning in classrooms across the state. There are very few classrooms that prepare students for the state test by providing them with an engaging, cross-curricular project about animal adaptations or bridge building. What about your day-to-day instruction? Would it improve? Would you venture away from your curriculum a little more often to do something more engaging? Would you worry less about covering it all and more about deep conversations among students? The curriculum in Texas (TEKS) is ridiculously too much. Common Core is too. Then districts turn the standards into units of study which actually add to the number of pages and materials and learning expectations. How would you attack the learning expectations for your students differently? learning and the tested portion was simply the measure. Unfortunately, it is the other way around. The test drives the machine of teaching and learning. Regardless, the test is a reality. The expectations from students, teachers, principals, districts, parents, and communities are a reality. So... based on these great questions, what can I do better?